I’m an HCPC registered Art Psychotherapist. Since I qualified in 2008 I have worked for Place2Be offering therapy within primary schools and Barnardo’s Family Service in Angus delivering art therapy to children in the looked after system who have experienced trauma. I did further training in Dyadic Art Therapy through the British Association of Art Therapists and in parent-infant work through the Anna Freud Centre in London and I am accredited as reliable in their PIRAT assessments (Parent Infant Relational Assessment Tool). I was particularly interested in the attuned relationship between a baby and their primary carer. I started the Create Together groups because I wanted to develop a way of using art therapy to help maximise the positive experience of this relationship for both baby and parent. I am happy to have received a studentship from University of Dundee to continue this research into art making in the early years with a doctoral research project. I joined the University of Dundee in September 2018, to undertake an MSc in Psychological Research Methods before commencing PhD research in 2019. I have almost fifteen years experience as a practicing artist, focusing on intergenerational participation. My projects have taken me around the world, working with groups in Finland, Japan and Hong Kong. From 2015-2018 I worked as Public Engagement Coordinator for Tramway, Glasgow, beginning with the public participation programme for Turner Prize 2015. My interests lie in the power of arts participation to increase confidence, wellbeing and literacy. 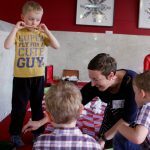 In 2017 I was awarded the Marsh Award for Excellence in Gallery Education for my work with families at Tramway. I am looking forward to working with Dundee Contemporary Arts to measure the long term impact of their family participation programme.